Eighteen years ago, I walked into a design store for an interview and walked out with a job that would change my life. It was my parents’ shop, after all. As it turns out, a love for beautiful homes and happy people is in my blood, and I’ve been doing my best to nurture that ever since. It’s not always paint swatches and mattress testing (I had no idea the time and amount of learning required to be successful in this business! ), but I’m still excited to be here, all these years later. Passion is key in design, and I’m lucky to feel more and more passionate about what I do each day. It’s an honor to help people give shape to their dreams, even while I’m still working on some of my own—I’m positive that if I was just one foot taller and a lot more coordinated I could have easily made it as a professional golfer. 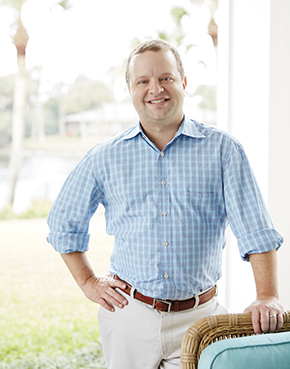 And while it’s not exactly the same as wearing that green jacket, I was thrilled to be named by House Beautiful and Traditional Home as one of the Top Young Designers in America in 2013. My work has also been featured in House Beautiful, Traditional Home, Southern Living, Coastal Living, Luxe, Country Living, Atlanta Homes and Lifestyles, Real Simple, and Trad Home. Somewhere along the way, I also managed to marry a wonderful woman and have two fantastic sons (who even afford me a decent night’s sleep every now and then). Every day I am fortunate to work with great clients and a very talented staff. My goal as a designer is the same today as it was from day one: I want to create spaces with longevity that properly reflect my clients’ personal styles and that can be enjoyed by everyone.